Rog: I need to ask you this: did a Clattenburg refereed game have a personality, if so, what were its traits? Clats: There's one game in particular, which was the "Battle of Stamford Bridge." It was Chelsea vs. Tottenham, if was the famous that year Leicester win the title, it was theater. 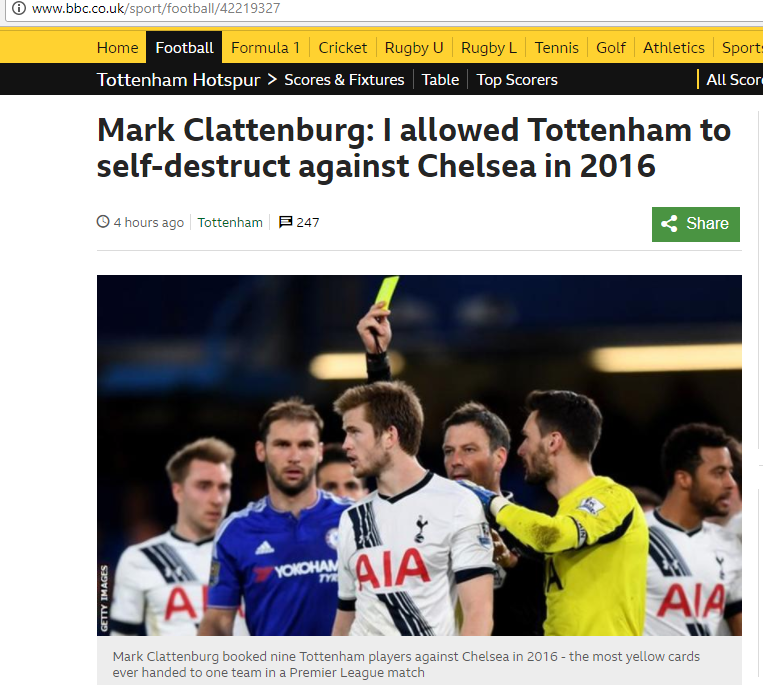 I went in with a gameplan that I didn't want Tottenham Hotspur blaming Mark Clattenburg that they were gonna lose the title. It should've been 3 red cards to Tottenham; I allowed them to self-destruct so all the media, all the people in the world went, "Tottenham lost the title." If I sent 3 players off from Tottenham, what's the headlines? 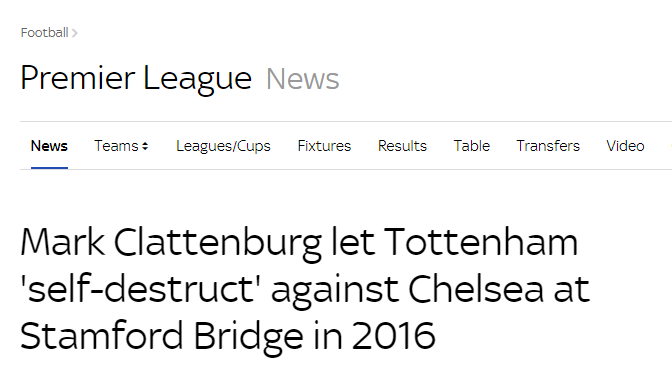 "Clattenburg lost Tottenham the title," and it was pure theater that Tottenham self-destructed against Chelsea and Leicester win the title. Rog: In that game, were the Chelsea players not screaming bloody murder, they're like, "Clattenburg what are you doing we're getting massacred here!" Clats: It was the first game where Diego Costa never got cautioned (laughs). It was so crazy when you look back at the game but, when Hazard scored to equalize to make it 2-2 I've never felt an atmosphere in a stadium before like that before, because of Chelsea had stopped one of the enemies winning the title. Rog: In a way you scripted it. Clats: ...I helped the game, I certainly benefited the game by my style of refereeing. Some referees would have played by the book and Tottenham would have been down to 7 or 8 players and probably lost, and Tottenham would've been looking for an excuse but I didn't give them an excuse, because me gameplan was let them lose the title. Rog: Listening to this, I was like, "Wow, Mark Clattenburg, even crazier than Diego Costa" (Clats laughs) that is saying something, but you've said, "I want games to be a spectacle," and hearing you talk about the Battle of Stamford Bridge, is that the referee's job or is it really down to the players? Clats: I think we're all part of theater. That's why the Premier League is the best league in the world. 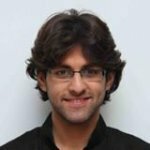 Its assisted by the best players, the best referees, the best coaches, and we've all got a duty to make sure the game's enhanced. The English style of refereeing is different; I had to referee differently when I went into Europe than I did in the Premier League because none of the top players in Europe would accept some of the physical contact that went on in the Premier League - but that was the theater, that's what people loved. They love a tackle, they don't want it punished. Rog: You pride yourself on man-management, its a phrase that comes up in conversation with you over and over, talking to the players rather than cautioning them, as you've said, you occasionally famously called them "mate" on the field. How do the players react to that? Do they really want to reciprocate and get on with the referee? Clats: Gotta know the right time, that what's experience. Some young referees will try to speak to players too much and players sometimes don't want them to speak. I remember refereeing Ashley Cole. Speaking to Ashley Cole at the wrong time when he was going through things with his head (garbled) doing some tactics. But there were good times to speak to Ashley Cole, when he was calm and he was ready to get on with. Speaking to the player at the wrong time can have a bad effect. Read it and weep. What a self-absorbed piece of sh*te. What the f**k!!! He is a ref and supposed to do his job!!! f**king c**t.
Would've been an even better spectacle if one of the Spuds' players broke Chelsea player's leg, or if Dembele actually gouged whoever the feck he was trying to gouge back then. For a better 'theatre' lions should be let loose and players should be equipped with swords and shields. No wonder Tottenham have had such "luck" with referee decisions, when you have such weak or arrogant referees that are to afraid to be blamed for stopping their title run. Jesus that's sickening, he should be struck of. I understand (and support) referees who try to use a bit of discretion and allow games to flow with fewer interruptions but this (assuming the interview is real) is practically an admission of professional misconduct. Knew this c**t loved himself so much to make it all about him. What if Eden didn't score a first touch powerful curling shot then you c**t? They would've won and you would've been in the headlines in the worst case scenario. I don't believe this account, the FA wanted the title fight to go on. Yeah, it stinks. And imagine Dier broke Hazards or Cescs leg with one of those assaults of his that night? Because the referee let them "self destruct". Scandalous and for me it also puts a lot of other things into the light again. "I went in with a gameplan that I didn't want Tottenham Hotspur blaming Mark Clattenburg that they were gonna lose the title." Did Ovrebo go in what that gameplan when we faced Barcelona in 2009? Makes you think doesn't it. He should have his Champions' League tattoo revoked. Can't be real.... If it is they should tell people they have this kind of role. He shouldn't share it, better for him and his name. He as a referee has to do his job, why should he care what other would say about him? Can't understand this, really. So he is no longer a ref. Head of refs in Saudi Arabia. This probably sheds a light to the whole profession. I think some refs will deny all this. And will hate Clattenburg for it. It sounds to me that refs are allowed to use their discretion to keep the match flowing and allow the spectacle or at least in certain matches. I have to agree in certain matches where refs do this though correct, it just ruins the game for the spectators as a contest. I suspect we are now hearing this as he has moved leagues. Further proof that the media is a massive influence on the referees, that's with help from punditry. Is it any wonder United, Liverpool & Arsenal get away with so many decisions? Tottenham that season and the season after were massively hyped by the British media, a lot of it was due to them having so many British players. There is no doubt there are many referees who feel just the same as Clattenberg did when they referee these games with teams that are heavily hyped by media. It's just protection now nothing more, the same happened for Liverpool back in 2014, if anyone can remember Liverpool couldn't stop winning games and when they needed 1 more goal you could guarantee they would get a penalty. But most of all they had the worst defence in the league out of the top 6 by a distance and would never concede a penalty. What referee would want to be in the spotlight for that? Stopping the mighty Liverpool and ruining their amazing season, the season the media highlighted as "JUSTICE FOR THE 96" Gerrards tears after every match, the drama. Imagine being a referee and stopping that? Something needs to be done about it. I like the traditional rules but they're being heavily duped and it's no longer fair. The more I read and see instances like this the more I start agreeing with @yorkleyblue that we need video tech to referee games, having more officials barely does anything. The other officials were supposed to help Arsenal against United on Saturday when it was a stonewall penalty, the other officials as always done nothing. EDIT: Actually no scrap that, after reading more of the podcast script the bloke seemed like he's happy about it and thinks it was right. Imagine if due to his "game plan" (his words) Spurs went on to win the title. It's not okay to be blamed for Spurs losing the title, yet it would have been okay to be blamed for Leicester losing it? Disgusting but not suprising especially from clattenburg, who always wanted to be centre of attention. He is pretty much admitting to match fixing, by purposely not sending off players to avoid back lash. We should've been playing against 8/9 men so he purposely denies us 2 points, which could've been vital in another year. Too many referees wanting fame nowadays in the prem. We would be better off with foreign refs in the prem. but that was the theater, that's what people loved. They love a tackle, they don't want it punished. It's not the referee's job to create theatre. It's the referee's job to officiate by the rules of the game. If that reduces the spectacle, so be it. What I have noticed, and it seems to be confirmed by Clattenburg's statements, is that this season, we've had better refs decisions in the UCL than in the PL. But I couldn't get any explanation for that... now it looks like Clatt has given - at least- one explanation! And right away Sky & the BBC are trying to make out like Tottenham are the victims.